The province’s police department partnered with U.N. agencies and the Red Cross to train the new recruits in modern investigation techniques and human rights law. They built new user-friendly police stations to entice people to bring complaints about everything from property disputes to police brutality. They established arbitration panels, called Dispute Resolution Councils, made up of volunteer jurists — including one former Supreme Court chief justice — to hear cases without lawyers and deliver verdicts within hours. If the parties reject the result, they can turn to the lengthy Jarndyce and Jarndyce-style deliberations of the Pakistani justice system. Mehsud, who succeeded Durrani as inspector general last March, told me that his and Durrani’s strategy was to change the culture of popular engagement with the police from one of fear to one of trust. The first step in the process entailed improving the image of the police with starched uniforms, shining belt buckles, polished shoes and lessons in deportment. Traffic constables, often the first responders at terrorist attacks, learned how to deal more sensitively with the public. Cynics dismissed the police experiment in Khyber-Pakhtunkhwa, but citizens soon started coming forward with information on Taliban, al Qaeda and Islamic State cells. Terrorist arrests shot up 400 percent from 294 in 2014 to 1,203 three years later. At the same time, suicide attacks dropped from 26 in 2013-14 to just six in the past year. Deaths from the attacks fell, too, from 185 to 23 over the same time period. Still, as the Agricultural Training Institute attack showed, the police have a long way to go. In the United States, meanwhile, President Donald Trump’s administration has taken little notice of the changes in Khyber-Pakhtunkhwa, while blaming Pakistan for the lack of progress in the war in Afghanistan. Police reform doesn’t fit the “war on terror” doctrine, which prizes drone assassination over solid police work. But to Mehsud, the terrorists are not warriors — they’re criminals. It was former British Prime Minister Margaret Thatcher who said of the Provisional Irish Republican Army’s militancy, “Crime is crime is crime.” And Mehsud is more motivated than most: Two of his sons died, along with more than 30 other people, in a terrorist bombing in Peshawar in December 1995. The drive to rid Pakistan of terrorists and corrupt politicians, to impose law and order, and to establish a fairer society needs international support. With it, the country has the chance to escape a legacy of theft, religious fanaticism and debilitating inequality. Without it, the goal of a state worthy of its citizens’ loyalty is beyond reach. Pakistani leaders’ legendary corruption thrives on bribes, shady arms deals and money-laundering services from outside the country. When the Panama Papers surfaced last year, then-Pakistani Prime Minister Nawaz Sharif was among the many world leaders whose dubious schemes to hide their wealth came to light in the leaked documents. Though he maintained his innocence, Sharif failed to provide an adequate explanation for how he had amassed his wealth on a prime minister’s salary. In a unanimous decision last July, the Pakistani Supreme Court forced the three-time prime minister out of office to await indictment. Finance Minister Ishaq Dar avoided arrest by removing himself to London for medical treatment. (The prospect of years in a Pakistani prison would make anyone ill.) Sharif, whose daughter is married to Dar’s son, must fear that the former finance minister’s return to Pakistan would come with a plea bargain that might incriminate him. 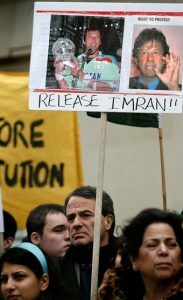 The Panama Papers scandal might have led nowhere but for a massive campaign of street protests led by the PTI’s Khan, the former cricket champion who founded the party in 1996. Even his enemies, who are numerous, concede that Khan’s determination and public rallies forced the Supreme Court to hear the case against Sharif. Here I have an interest to declare: Khan and I have been friends for 30 years. As Pakistani journalist Mohammed Hanif, whose work I admire, wrote in the Guardian, “Visiting foreign journalists have profiled Imran Khan more than they have profiled any living thing in this part of the world.” I apologize to Hanif for adding yet another story to the collection, but like Sgt. Joe Friday of “Dragnet,” I’m sticking to the facts, ma’am, just the facts. Khan told me that the link between corruption and the disillusionment that leads some young men into jihadist groups should be obvious. “It’s your money he’s stolen,” he explained. “Because they take money out of the country, we go to the (International Monetary Fund). They raise taxes to pay the IMF.” Pakistan could, he believes, repay the national debt if all the criminal funds sent abroad were repatriated. Then it could afford to build schools, hospitals, roads and sports centers. Khan’s party will run again for the national parliament in 2018, and he expects to win. It’s a long shot, but he’s succeeded in the past against steeper odds: coming out of retirement to lead Pakistan’s national team to victory in the 1992 Cricket World Cup; building the first cancer hospital in South Asia in 1994, then another cancer hospital and a university. The hard part won’t be winning the election, though. It will be governing a country that has resisted governance since its creation in 1947.